continue reading "Another homemade pie?! 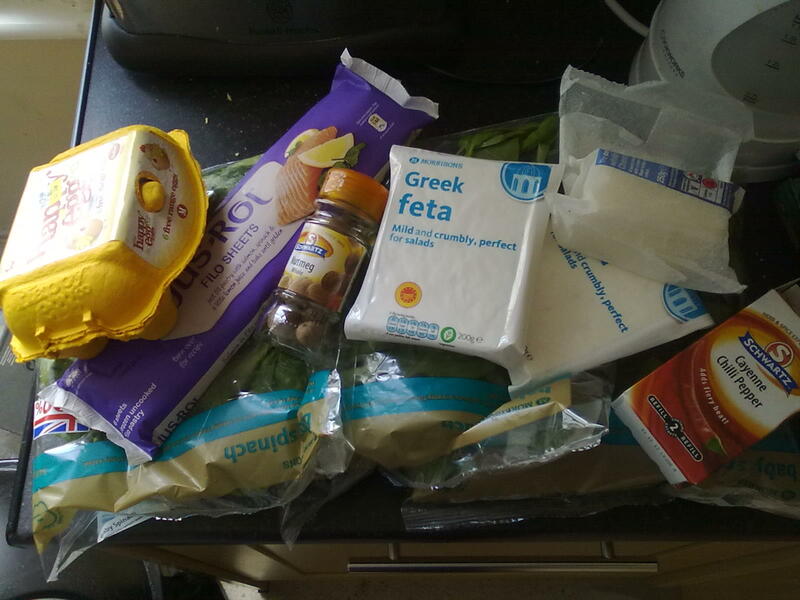 This feta be good..."
Here at Pierate we're not know to stick to the conventional. 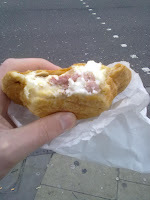 We try anything, egg and bacon pie, lentil pie, polabe pie and popcorn pie to name but a few of the myriad of largely digestible products enclosed in the familiar golden pastry. So when we decided to host a gathering at our flat in the name of Eurovision I decided to push the boat out and go for a new creation, Risotto Pie. 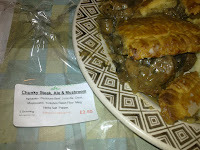 Yes, a pie with rice in, unusual but it seemed appropriate as a blend of European cultures. Here is what you'll need to make a fairly large vegetable and rice pie. Et voilà! The rice loves it's new found pastry home, melting into a creamy filling. I cannot really speculate as to how good everyone else found the pie but I would hope it didn't receive nul points. The only reason I felt sick was the lack of talent on display and the inexplicable choice of winner, Azerbaijan? Their song was certainly more cheesy than this pie! continue reading "Rice rice baby." We don't want to be counting our eggs before they've hatched but we think we've found a real friend with Jumbucks here. We gave Jumbucks a favourable review once before (a few days off exactly a year ago) and so were hungry to give them a retrial and see if they're still as good. Since it's morning, I felt it was appropriate to try their Bacon and Egg pie. It certainly seems like a suitably wacky combination for an innovative pie shop like Jumbucks - let's hope it gives me the kickstart I need to the day. Again, in the spirit of Jumbucks, I take my pie on a walk around Shepherds Bush, and actually partially down the escalator in the tube station. This truly is a pie on the go. But what about the pie itself? Well, the description doesn't lie - it is bacon and egg all right. I wasn't too convinced it was going to be a great combination in a pie when I bought it - and on tasting it, I'm still a bit unsure. It looks a little congealed and weird, in my opinion. Eggy pie ain't really my cup of tea, I don't think - but it's not unpleasant and the fact that I can have a pie for breakfast does have to be celebrated. continue reading "Wake up and smell the bacon"
continue reading "Pound for a pound (and quite a few extra pence, actually)"
So I was doing a bit of paremiology earlier (that’s the study of proverbs to you and me), having just eaten a Steak and Ale Pie at The Proverbial in Harborne. No, really, I had. I hadn’t proverbially eaten a proverbial pie...I actually did eat it. Honestly, let’s not cry over spilt milk – I did eat the pie. How could I not of, for I can’t comment on a pie I haven’t eaten. Just like people who live in glass houses shouldn’t throw stones (who lives in glass houses, I do not know...but I digress), a pierateer must seek and eat new pies to rate, not make reviews up! 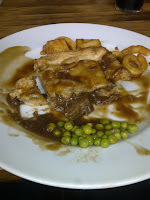 Anyways...having ordered my British Steak and Batemans Ale Shortcrust Pie, with British steak and mushrooms and served with the classic curly fries and peas, the first thing to notice after cutting into the beautifully crafted rectangular pie case was that there was not, in fact, any mushroom in it! Alas, while feeling a bit cheated out of the content, the important thing was that the steak was very nice indeed and the ale-y gravy complimented the pie very well. 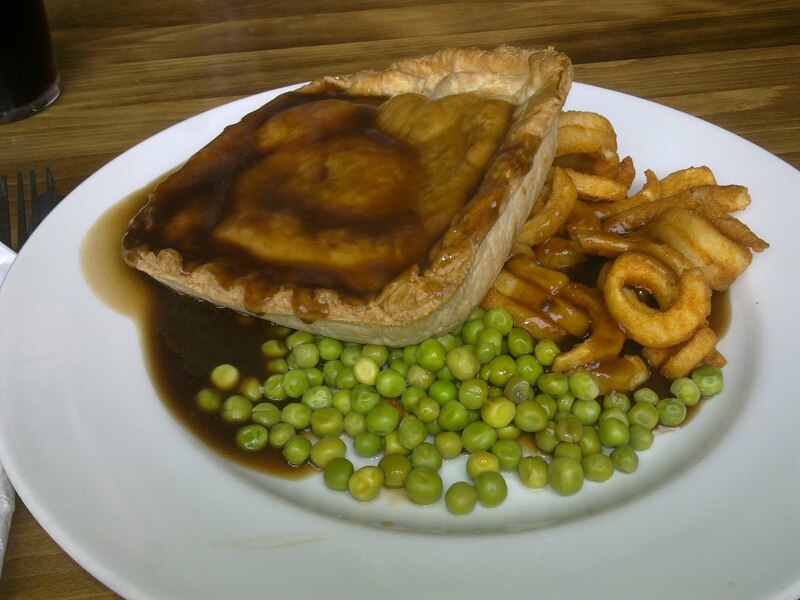 While the crust was quite thick and solid, perhaps slightly too stodgy for top marks, the pie did come served in tip-top condition and the gravy boat on the side for adding your own extra gravy was a welcome addition. The pastry was golden, the content was delicious (bar the lack of mushroom) and not at all chewy, and the capacity was pretty spot on too. 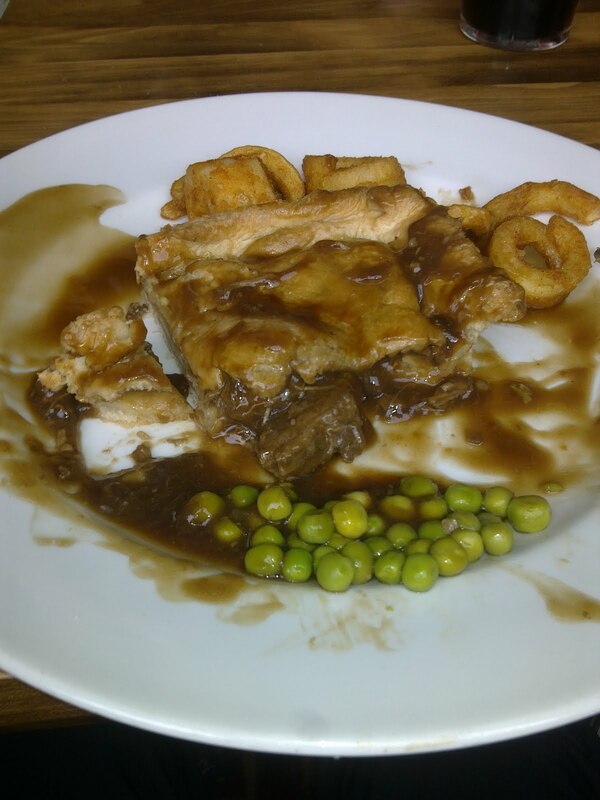 While not the cheapest meal on the menu, it certainly stood out as a decent pie. Some people say that ignorance is bliss, but I wouldn’t want you to be ignorant about the pie on offer at this Smith & Jones pub in Birmingham. So while you can lead a horse to water but can’t make him drink it, you can certainly take a pie lover to The Proverbial and encourage him to eat pie. A warmly recommended meal with the lads - I enjoyed it. continue reading "What would the proverbial pie taste like?" With such a strong recommendation from a friend, I eagerly anticipated the arrival of Mr Senei and the Sheffield Country Market Pie he had picked up for me the previous weekend. It did look very nice from the outside and I quickly put it in my oven to heat it up for my evening meal. 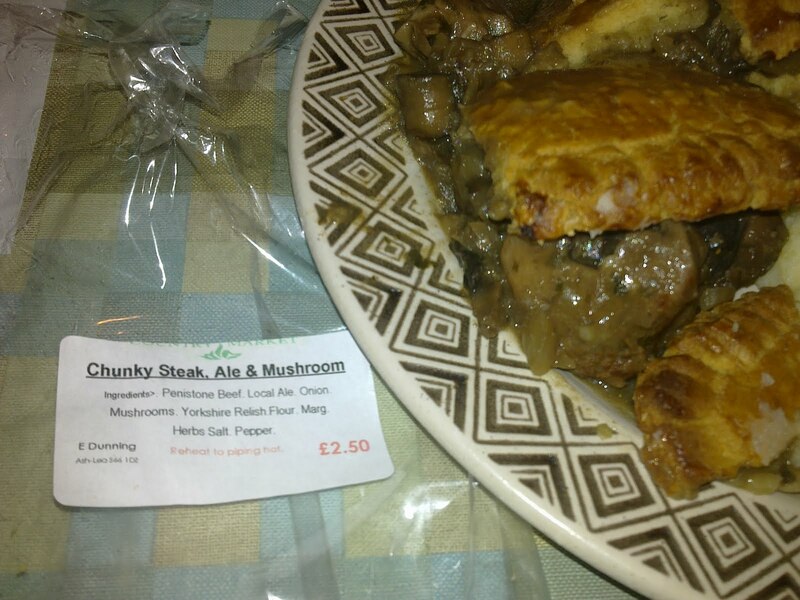 I hadn’t previously had a steak and mushroom pie before, so I was anticipating the flavour (which I had only previously encountered in a casserole). What would the Sheffield Country Market pastry add? 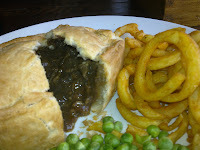 Would I need to start regularly ordering my pies from Sheffield? Could it live up to the expectations? Well, the short answer to that is unfortunately “no”. But why, I hear you cry? Well, as sad as it is to say, I unfortunately was left hanging on the pastry front when I came to crack the pie out of its silver foil casing. For what I did not expect, and unfortunately found, was that the silver foil was in fact the base and side of the pie, and not pastry! Having managed to take the lid off the pie, which was quite firmly stuck to the foil on the top (hence the poor, broken condition of the lid in the photo), I was shocked to find no base or side pastry and thus had to scrape the contents of the pie from the foil casing. This was not only time consuming but also meant some of the content was left stuck on the foil, rather than in my stomach. Not ideal! So after that absolute shocker, how did the pie taste? Well, rest assured pie fans, the Sheffield Country Market did claw back some pride by producing a very fine tasting top-crust pie. The steak was very succulent, the gravy (while slightly lacking in quantity) was very nice and the mushrooms added a distinctive taste even if it was perhaps slightly too mushroomy for my personal preference. The lid, although it did fall apart during removal from the foil tray, was both crisp and tasty. 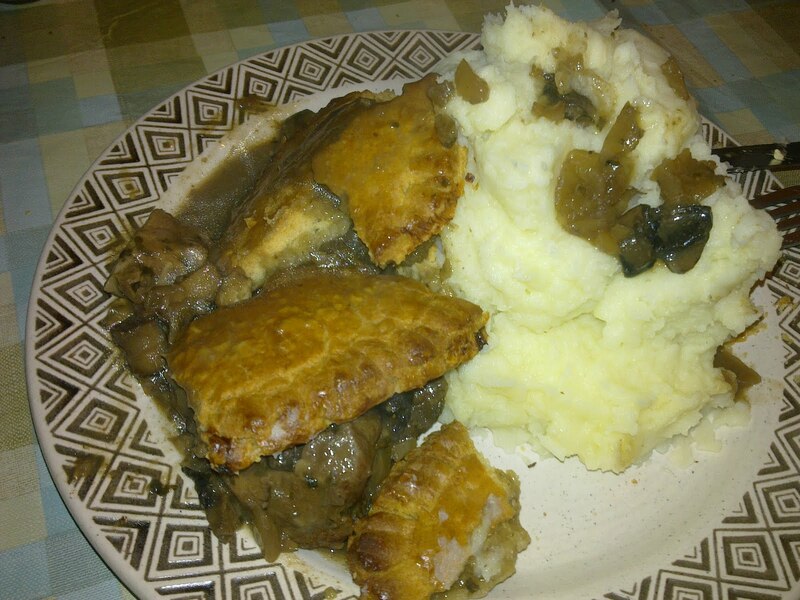 It therefore was quite a top quality pie content, once the lack of proper pastry casing had been factored in. Upon discussing my disappointment with regards to the pastry situation, I was assured by the purchaser that another pie bought from the Sheffield Country Market at the same time did in fact have a full pie casing (lid, sides and base), which makes me wonder if I was accidentally given a “dud”. However, I can only review what I am given. As such, I can only recommend this pie as a very good top-crust pie and not wholeheartedly commend this as a great pie. 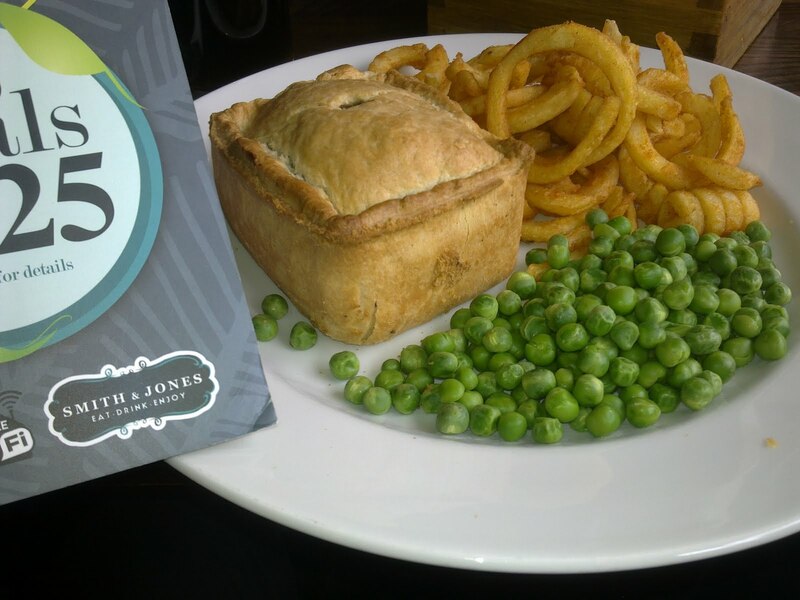 continue reading "I ate a pie, a very big pie, from the Coun-try (Market in Sheffield)"
At the end of a long roadtrip, which has ended in the lovely seaside town of Hunstanton in Norfolk, you’re certainly up for a refreshing drink by the sea front and ideally a good pie too. Which is exactly what this roadtripper was looking for, having spent the majority of the last 10 hours sat in the car navigating (quite successfully I must add) the car to its final destination. And so it came as a great reward to find The Waterside Bar and Restaurant literally just a stone’s throw away from the beach and with a great view of the sun setting out to sea on the horizon. So with such a great setting and a successful roadtrip in the bag, would we sea a great pie rustled up? Would we net a great catch? Or would the pie be sandalous in its quality? The first thing to notice was that this pie was served in a ceramic dish, which immediately confirmed my worst fears that this was unfortunately a pastry base & pastry side-less pie. There was only pastry on the top of the pie and it wasn’t exactly firmly attached onto the pie dish (in fact, it could be picked up and removed without any effort, indicating that this could have been cooked separately to the meat and added as an afterthought. 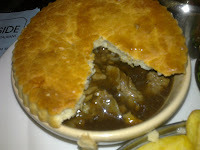 It was however placed on the top of the meat dish, so it looked reasonably like a pie by the time I was about to eat it. So having confirmed it was a top-crust only pie, on with the reviewing. The actual lid itself was certainly a different taste to what I would normally come to expect from a savoury pie. It was a lot doughier than most other pies I have eaten, and while it took a little getting used to, by the end of the meal it had all been consumed and was enjoyable. However the meat was absolutely delicious, with literally no gristle and it was very filling. The steak pieces were very succulent and were complimented immensely by the gravy provided. Interestingly this pie did not really have any gravy within the pie dish upon arrival, but being provided with the gravy jug you were able to add as much or as little gravy as you wished. I for one thought this was a great idea and would certainly recommend other eating establishments consider providing this gravy service to their pies too. 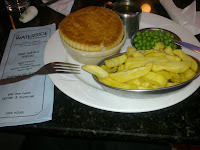 The chips and peas were also very nice, meaning I was left with the impression that despite the lack of side and bottom pastry, this was actually one of the nicest pies I had eaten in terms of a pure taste test. I would certainly recommend roadtripping to The Waterside Bar and Restaurant to anyone in (or even nowhere near) the Norfolk area. Note: Having just logged onto the website for The Waterside Bar and Restaurant I just have to applaude the fact that on the homepage it mentions just one food item from it's menu: "Have you tried our steak pie?" Yes! 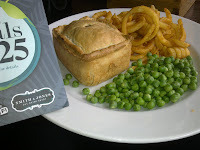 Yes I have actually, and I've put a review up on my blog and it was a very nice pie! This place just gets better and better! continue reading "What-a Waterside Restaurant in Hunstanton"